Active orthodontic treatment with fixed appliances generally last for 2.5–3 years and a successful bonding ensures good treatment progress. Efforts are therefore constantly on to improve bond strength, especially in challenging situations such as bonding to gold, porcelain, and amalgam, but the condition that challenges the orthodontists most is fluorosed enamel. The problem is not only limited to endemic fluorosis regions but is also more universal now with the recent widespread use of fluoride supplemented children's vitamins and the artificial fluoridation of most community water supplies. Espinosa et al. in 2008 through his SEM study showed that the use of 5.25% sodium hypochlorite (NaOCl) for 1 min before acid etching improves both the quantity and quality of the etched surface, and thus, he suggested that this method has the potential to be effectively used to optimize adhesion and improve bond strength. This process referred to as deproteinization doubles the retentive surface of enamel to 94.47% and also results in an increase in the Type 1 and 2 etched enamel which have significantly greater retentive capabilities than the usual Type 3 etch pattern thus significantly improving the retention. It has also been shown in SEM study by Espinosa et al. that NaOCl is an effective protein denaturant and removes excess protein. This excess protein, interferes in establishing a clinically successful acid etch pattern and thus its removal enhances bonding. As the protein content of fluorosed enamel is significantly higher as compared to normal enamel, it seems feasible that deproteinization can be used on fluorosed enamel to increase the bond strength of brackets bonded to them. Deproteinization thus has the potential to emerge as a cost-effective, noninvasive, and convenient method to increase bond strength in bonding to fluorosed teeth which can be readily and easily used in day-to-day clinical practice. Up to the writing of this article, to the best of our knowledge, no research has been published evaluating whether deproteinization with 5.25% NaOCl before acid etching increases the shear bond strength (SBS) of brackets bonded to fluorosed teeth using composite. Hence, this study was carried out to examine the effect of deproteinization with 5.25% NaOCl on SBS of brackets bonded to fluorosed teeth and also to study the surface topography of deproteinized fluorosed teeth by SEM. The present in vitro study was conducted in the Department of Orthodontics and Dentofacial Orthopaedics, Post Graduate Institute of Dental Sciences (PGIDS), Rohtak (Haryana); Central Institute of Plastic Engineering and Technology, Murthal (Haryana); and Advanced Instrumentation and Research Facility Centre, Jawaharlal Nehru University, New Delhi. Sample size was calculated for an effect size of 0.7 at 95% confidence interval and 99% power. It was anticipated that data may be nonnormally distributed and to compensate for nonparametric distribution sample size was increased by 15%; thus, the final sample size was calculated to be 20. The forty fluorosed teeth used in this study were selected from approximately two hundred mandibular first premolars (collected over a period of 4 months) which were extracted for orthodontic reasons from patients visiting the Department of Orthodontics, PGIDS, Rohtak, for fixed orthodontic treatment. All the patients were aged between 14 and 25 years. Teeth with caries, visible defects, obvious damage or abrasion, cracks due to extraction with forceps, malformed teeth, surface defects (erosion, attrition, abrasion) restored tooth, root canal treated teeth, teeth subjected to previous chemical treatment, teeth with pathologies such as enamel dysplasia, enamel hypoplasia, amelogenesis imperfecta, and dentinogenesis imperfecta were excluded from the study. Immediately after extraction, the extracted teeth were thoroughly washed in tap water to remove blood, debris, and adherent tissues and the surface dried and the fluorosed teeth were classified (teeth with Thylstrup and Fejerskov index [TFI] 4 were used). The fluorosed teeth used in the study were classified by the consensus of two investigators (MV and RS) as per the modified TFI  [Table 1]. Specimens were then stored at room temperature (for a period varying between minimum of 3 days and a maximum of 1 month) in distilled water solution of 0.1% thymol (w/v) for disinfection and to inhibit bacterial growth. As soon as the required sample was completed, teeth were divided into two groups of twenty teeth each. The teeth were cleansed and polished for 10 s with a rubber prophylactic cup using a nonfluoride pumice and then washed with water and dried. All the teeth were then bonded as described below. After bonding, the teeth were then embedded in a cold cure acrylic resin block using a jig to align the buccal surface of each tooth parallel to the base of cylinder [Figure 1]. Preadjusted edgewise mid-sized mandibular first premolar (Gemini, 3M Unitek, Monrovia, CA, USA) 0.022'' slot brackets without hooks were bonded to all tooth samples. According to the manufacturer, the average surface area of the bracket base was 9.08 mm 2. Group I (control) (bracket bonded to teeth with composite resin without deproteinization): The teeth (20 in number) were etched with 37% phosphoric acid (Frost Amdent) for 60 s, then washed in water for 10 s, and dried with oil-free compressed air. A thin layer of primer Ortho Solo (Ormco, Orange, California, USA) was applied on the etched enamel and cured for 10 s. Using syringe tip, the adhesive was placed on the entire base of the bracket, without bubbles or voids. The bracket was then placed on the tooth and seated with an explorer using sufficient force to squeeze excessive adhesive around the bracket, so that a uniform thickness of adhesive is achieved. A small scaler was used to remove excess adhesive flash, and then, the bracket was cured for 40 s (10 s on each side of the bracket) with light-emitting diode light cure of 230 V, 50/60 Hz, and 0.5 A (Ivoclar Vivadent, Schaan, Liechtenstein). Group II (experimental) (bracket bonded to fluorosed teeth using composite resin after deproteinization with 5.25% NaOCl): 5.25% NaOCl was applied with the help of microbrush for 60 s on the teeth, washed with water, and dried with air. After deproteinization, the same protocol of application of etchant, primer, and adhesive and light cure was followed as described in Group I. Moreover, the same products were used. 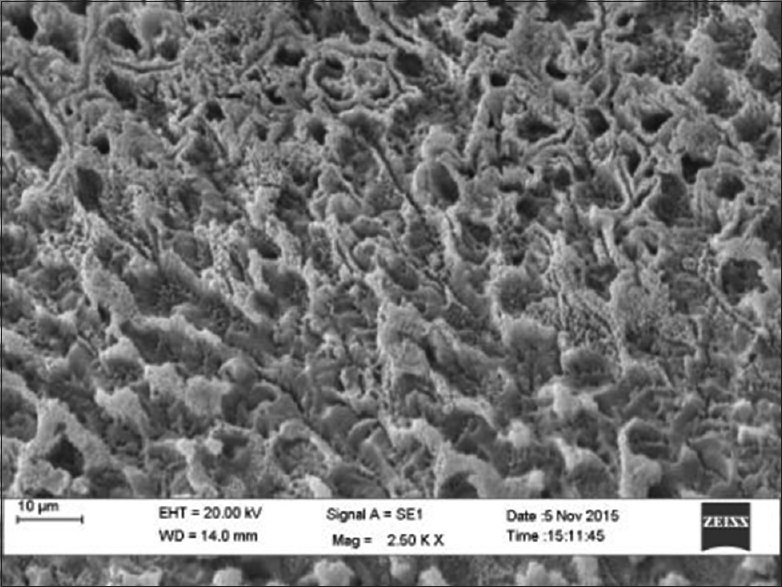 The type of etch pattern with and without deproteinization before etching was observed under SEM. Ten fluorosed teeth with TFI 4 were taken, cleaned, and randomly divided into two groups with five teeth in each group. In one group, the buccal surface of the premolars was deproteinized with 5.25% NaOCl for 1 min followed by normal bonding protocol of rinsing, drying, and acid etching for 60 s followed by primer and adhesive application. Samples were prepared according to standard protocol to observe under SEM (Carl Zeiss SEM EVO 40) which was operated on an accelerating potential of 20 kV, and then, etching patterns were observed. The same bonding protocol was used in the control group, except that deproteinization was not done before bonding. The teeth were prepared for observation at ×2500 magnification. After bracket bonding, the teeth were stored in distilled water at room temperature until they were submitted to the shear test. A universal test machine with a load cell of 500 N (Shimadzu Autograph AG-IS) was used, operating at a speed of 0.5 mm/min. In the universal testing machine, each specimen was placed with its long axis parallel to the direction of the applied force. A loop was made using 020” stainless steel wire and the ends of the wire were gripped in acrylic block (to secure the stainless steel wire), which in turn was fixed to the upper jaw. Loop was engaged under wings of bracket on which shear force is to be applied [Figure 2]. The specimens were stressed in an occlusogingival direction with a uniform crosshead speed of 0.5 mm/min. The maximum force necessary to debond or initiate bracket failure was recorded in Newton. The SBS in megapascals (MPa) was computed as a ratio of force in Newton to the surface area of the bracket (9.08 mm 2) as informed by the manufacturer. After debonding, all the teeth and brackets in both the control and experimental groups were analyzed using a light stereomicroscope (Model No. RSM-9 RADICAL) at ×10 magnification to determine the failure interface. Any adhesive left on surface of teeth after debonding was assessed and scoring was done according to the modified adhesive remnant index (ARI; Olsen et al., 1997). Shapiro–Wilk test was used to determine the normalcy of the data. Then, mean and standard deviation of the SBS values were calculated for the samples of the two groups. Each group has twenty sample teeth. Unpaired t-test was used to compare the mean debonding force (Newton) among the two groups. Significance for all statistical tests was prechecked at P ≤ 0.05. The statistical analysis was made with the statistical program IBM SPSS 20.0 (New York, USA) for Windows. The descriptive statistics, including mean, standard deviation, standard error, and P value for the two adhesive systems, is presented in [Table 3]. The mean value found in Group II (12.53 ± 4.14 Mpa) was significantly higher than the mean value of Group I (8.14 ± 2.95 Mpa) and the difference was found to be highly statistically significant (P = 0.000). The use of NaOCl before acid etching increased the bond strength of brackets bonded to fluorosed teeth. When the enamel surfaces of the deproteinized and nondeproteinized teeth (five premolars in each group) were examined under the scanning electron shows that the enamel conditioned with NaOCl produced a qualitatively rougher enamel surface than the enamel in which NaOCl was not used. The SEM images from the experimental group (using NaOCl) show a better etch pattern (Types 1 and 2) than the images of the control group, in which NaOCl was not used (Type 3 etch pattern) [Figure 3] and [Figure 4]. Chi-square test showed that there is no statistically significant difference between the ARI scores among the two experimental groups [Table 4]. Bond strength is an important parameter in orthodontic treatment for success and efficiency, and therefore, conditions in which bond strength is compromised are areas of constant research. Out of these conditions of compromised bond strength, “fluorosis” is under discussion in this study as the location of this study is an endemic fluorosis area  and orthodontists here are constantly facing the problem of frequent bracket failures leading to increase in treatment duration and both operator and patient inconvenience. Espinosa et al. in 2008 showed that the use of NaOCl (deproteinization) before etching eliminates the organic substances from the enamel surface and this can theoretically increase the orthodontic bond strength because it results in an increase in the total etched area as well as predominantly Type 1 and 2 etching patterns  which have been shown to be more retentive than Type 3 etching pattern. Since the compromised bonding in fluorosed teeth is because of the difficulties in etching of the fluorosed surface, it seems plausible that a technique which improves the quantity and quality of etching will improve the bond strength in fluorosed teeth. The main aim of the present study was to determine whether deproteinization by application of NaOCl, for 1 min before etching, increases SBS of brackets bonded to fluorosed teeth using composite resin thus providing a noninvasive, cost effective, and easy method of increasing bond strength in fluorosed teeth. The findings indicate that it does! The mean SBS of the brackets in Group I (without deproteinization) was 8.14 ± 2.95 Mpa whereas the SBS of brackets in Group II (deproteinization), i.e., when the enamel was conditioned with 5.25% NaOCl before a 60 s etching with 37% phosphoric acid followed by bonding with composite resin was 12.53 ± 4.14. Thus, there was statistically highly significant increase (P = 0.000) in the bond strength of brackets bonded to fluorosed teeth after deproteinization. Although bond strength value in the range of 6–8 MPa considered acceptable in clinical practice, the “ideal bond strength” is difficult to define as every patient is unique with respect to the ability of their enamel to be etched and their individualized masticatory and intraoral factors that may affect bonding and bond strength. However, the SBS values in the deproteinized flourosed group (Group II) are well above the clinically acceptable values of Reynold  and hence should be sufficient in a clinical setting. This highly significant increase in the bond strength can be attributed to the qualitatively rougher enamel surface obtained after conditioning with NaOCl as observed with SEM study of the deproteinized fluorosed teeth. 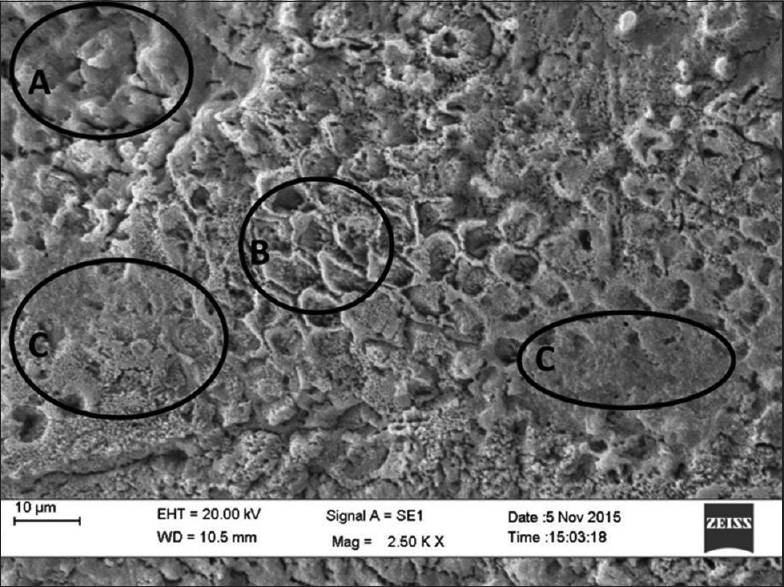 On the SEM pictures of deproteinized enamel surfaces of premolar teeth, Type 1 and 2 were observed [Figure 4] whereas the etching pattern in premolars where no NaOCl was used was seen to be of Type 3 [Figure 3]. Similar results have been reported by Espinosa et al. in 2008. Thus, it can be said that deproteinization before acid etching improved the mean SBS of brackets bonded to fluorosed teeth to a clinically significant level. Although the quantity of NaOCl used in this procedure is small as compared to endodontics where a large quantity is required as a canal irrigant precautions should be taken in its clinical handling. The patient clothing should be protected by plastic bib and both operator and patient should wear protective eyeglasses to prevent any damage due to accidental spilling. Saliva suction tip should be positioned in such a fashion as to suction away all NaOCl excess. Based on the findings of the present study, it is recommended to deproteinize the fluorosed enamel surface with 5.25% NaOCl for 60 s before acid etching to improve bonding strength of brackets bonded to fluorosed teeth. 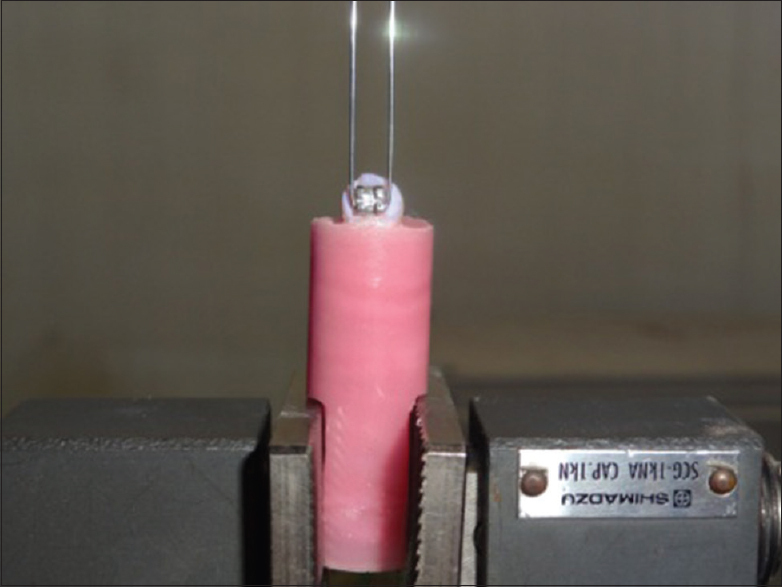 The results obtained are encouraging, suggesting a noninvasive, cost effective, and easy alternative method of increasing bond strength in fluorosed teeth. However, combining clinical aims with the best available evidence should be an important goal of every clinician and in vivo testing of the effectiveness of this method would be a worthwhile endeavor. The method can also act as a useful alternative to increase bonding strength to clinicians who place laminate or composite resin veneers on moderately to severely fluorosed teeth. Future studies can be carried out on the same material methodology to further approve/disapprove findings as we have not found any other study testing the effect of deproteinization on fluorosed teeth. Deproteinization with 5.25% NaOCl before acid etching offers a cost effective, noninvasive method of enhancing bond strength in fluorosed teeth. Miller RA. Bonding fluorosed teeth: New materials for old problems. J Clin Orthod 1995;29:424-7. Wiltshire WA, Noble J. Clinical and laboratory perspectives of improved orthodontic bonding to normal, hypoplastic, and fluorosed enamel. Semin Orthod 2010;16:55-65. Ateyah N, Akpata E. Factors affecting shear bond strength of composite resin to fluorosed human enamel. Oper Dent 2000;25:216-22. Noble J, Karaiskos NE, Wiltshire WA.In vivo bonding of orthodontic brackets to fluorosed enamel using an adhesion promotor. Angle Orthod 2008;78:357-60. Suma S, Anita G, Chandra Shekar BR, Kallury A. The effect of air abrasion on the retention of metallic brackets bonded to fluorosed enamel surface. Indian J Dent Res 2012;23:230-5. 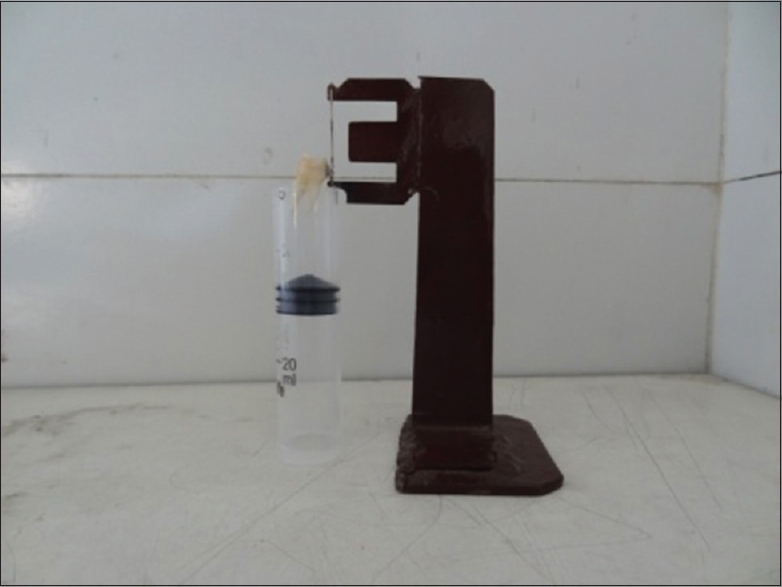 Espinosa R, Valencia R, Uribe M, Ceja I, Saadia M. Enamel deproteinization and its effect on acid etching: An in vitro study. J Clin Pediatr Dent 2008;33:13-9. Wright JT, Chen SC, Hall KI, Yamauchi M, Bawden JW. Protein characterization of fluorosed human enamel. J Dent Res 1996;75:1936-41. Isci D, Sahin Saglam AM, Alkis H, Elekdag-Turk S, Turk T. Effects of fluorosis on the shear bond strength of orthodontic brackets bonded with a self-etching primer. Eur J Orthod 2011;33:161-6. Olsen ME, Bishara SE, Damon P, Jakobsen JR. Evaluation of Scotchbond multipurpose and maleic acid as alternative methods of bonding orthodontic brackets. Am J Orthod Dentofacial Orthop 1997;111:498-501. Justus R, Cubero T, Ondarza R, Morales F. A new technique with sodium hypochlorite to increase bracket shear bond strength of fluoride releasing RMGICs: Comparing shear bond strength of two adhesive systems with enamel surface deproteinization before etching. Semin Orthod 2010;16:66-75. Becking AG. Complications in the use of sodium hypochlorite during endodontic treatment. Report of three cases. Oral Surg Oral Med Oral Pathol 1991;71:346-8. Reynold I. A review of direct orthodontic bonding. Br J Orthod 1979;2:171-8.